Attended Oberlin College. Founding member of Woodlands Community Orchestra. 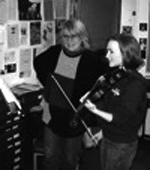 Has been teaching violin, viola, and fiddle since 1977. Trained in Violin Suzuki method. Performances with Connoisseur Concerts, Spokane Bach Festival, Lake Chelan Bach Fest, 22 years with Spokane Symphony, and the Klezmer music group Chutzpah. Previous faculty member of Holy Names Music Center in 1980 and from 1987-1993. Bachelor’s Degree from the University of Redlands in California; studied with John Golz. Further studies at the University of Iowa under Charles Tregor. Principal viola of Spokane Symphony from 1975 to 2000. Performances with Spokane String Quartet for 19 years, including tours in Germany and Taiwan, and Francesco Trio for 3 years. Performs with Tedesca Piano Quartet. Faculty member at Holy Names Music Center since 1993. Faculty Representative on Holy Names Music Center’s Board of Trustees.